*Today was a fun day of seeing people I hadn’t seen in a while and making a new friend. *I headed out early this morning to drive to Coeur d’Alene High School to spend the day judging events in the District Speech competition. Paul had 10 students participating in the competition, and he needed a judge, so I said I would be glad to go. The drive to Coeur d’Alene this morning was spectacular. As I hit the Cataldo Flats, the fog was rising off the Cataldo Slough, but up above the sky was a bright blue. As I drove through the Fourth of July Pass, the trees were covered with the freshly fallen snow from the day before, and the contract with the bright blue sky was breathtaking. I wish I could have pulled over and taken some photographs. It was a wonderful way to start the day, with all that beauty. *One of the first people Paul and I saw was one of my former KHS English teachers Joe Partington. He was my basic composition teacher and my advanced composition teacher. Paul had him as a basketball and track coach. Throughout the day we visited about our families and what our kids were doing, and about KHS. It was really great seeing him. He and his wife Andrea, who was also my English teacher at KHS, both teach part-time at Lake City High School. *Kenzie Sherman Lewis was also there. She coaches the Speech students from Post Falls High School, so we had a chance to visit for a while. She also used to teach English at KHS. We had fun catching up (beyond what we see in each other’s lives on Facebook). It is always wonderful to see her warm and smiling face. *I judged four different types of speeches today. First was Radio Broadcasting, which was a really fun event. Students create a radio broadcast using news articles, a commercial and a commentary. Then I judged Informative Speaking, where a student takes a topic of their choosing and informs others about it. I learned about Online Dating, The Disappearance of Amelia Earhart, and Hidden Wonders About Idaho. The last two rounds were Serious Interpretation and Humorous Interpretation. I was very impressed with the pieces in the SI round. The HI round was very short (only three competitors), and, I hate to say it, but done of the three selections were that funny. But all in all, a good day, and I am glad I judged. One of Paul’s students, Savannah Hartenfels, made it to the State Competition which will be in April at Madison High School in Rexburg, Idaho. *Speaking of Madison High School in Rexburg, Idaho, Mr. Partington and I visited about the state basketball tournament, the year I graduated from high school in 1981, and the our heartbreaking loss to Madison High School. I think the game was played in one of the high school gyms in either Coeur d’Alene or Post Falls. Can anyone out there remind me where the game was played? I just remember being up in the balcony playing in the pep band, but can’t remember what gym it was played in that night. Today, our Kellogg boys lost the consolation game to Sugar Salem, 62-60 with two overtimes. It is an end of an era with these young gentlemen, many who have played basketball together since about 2nd grade. I know I have enjoyed working with them in my Gear Up program since they were in seventh grade, and I it is exciting to see where life may take them after they graduate in June. *After I was done with my judging duties, I drove down the road and did some shopping at Costco, then picked up a photograph I had ordered at Walgreens, then went to Pilgrim’s Market to do some more shopping. It was a beautiful, sunny day in Coeur d’Alene today, and it was nice being out and about. Remember yesterday I talked about making Cauliflower Rice? 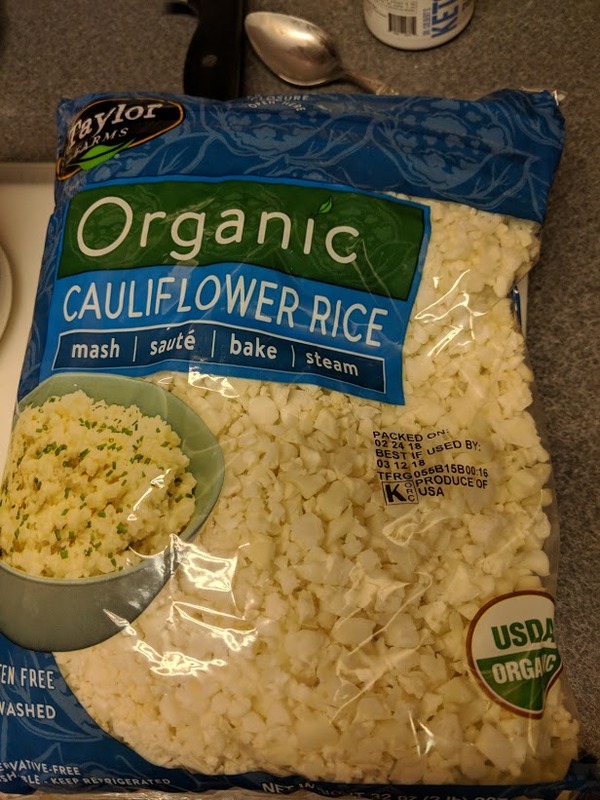 Well I found a bag of Cauliflower Rice at Costco today and purchased it to see if I have better luck making it. *My first attempt at this paragraph was not very good. I think I accidentally deleted part of this paragraph, so it originally didn’t make sense. My brother, my sister and my friend Linda pointed out the error. Thank both so much!! Now I know at least three people read my blog this morning...LOL!! So here is the edited, hopefully better understandable version. After I was done with my judging duties, I drove down the road and did some shopping at Costco, then picked up a photograph I had ordered at Walgreens, then went to Pilgrim’s Market to do some more shopping. It was a beautiful, sunny day in Coeur d’Alene today, and it was nice being out and about. I needed to stop at one of my fellow P.E.O. sister’s houses to pick up some items for an upcoming event. I found out Betsy’s house was only about five minutes from Pilgrim’s Market. It is a part of Coeur d’Alene I don’t think I had ever been, high up on a hill south of I-90 east of 15th Street. When I arrived at her home, the view was amazing, as I looked over Coeur d’Alene and the lake. Betsy is one of those warm and welcoming people who I visited with for about half an hour or so, and we instantly hit it off. We covered a wide variety of subjects on that short visit, but she was delightful, and I look forward to having other encounters with Betsy in the future. *I don’t often yell at other drivers while I myself am driving in the car, but I was yelling at another driver on my way home from Coeur d’Alene tonight. I was driving down the Fourth of July Pass when I got behind a semi-truck that was going a little slower, so I pulled over to pass him. There was a PT Cruiser in front of me who was also passing the semi, but doing it very slowly. Then the PT Cruiser would pass the semi, but would not pull over, and there was not enough room for me to pull over. Cars started piling up behind me, and at one point, the semi truck started passing me on the right. And I just keep yelling at P.T. Cruiser driver, “Pull Over! Pull Over! !” It was rather dangerous. Finally P.T. Cruiser driver got enough ahead of me and the semi that I was able to pull over in front of the semi and speed past the P.T. Cruiser, and get back up to speed. I am not sure how many cars had backed up behind us during that whole escapade. And the roads were not icy. I think they may have looked wet from the deicer on the road. And I understand if you are not used to driving the Fourth of July pass at night, it can be a bit intimidating, but this was rather dangerous!! *When I arrived at home, I put the groceries away, looked at the dishes piling up in the sink and on the counter and said to myself, “Nope, don’t feel like doing you tonight”, and did some other things until Paul arrived home after his play and we got ready for bed.